EIRPAC 2017 is the second edition of the International Meeting of Reflexão sobre Práticas Artísticas Comunitárias. It took place in Porto from 19th to 21st September 2017 thanks to the commitment of Isabel Bezelga – associate professor at the University of Evora, where she is involved in investigating the conjunction between artistic creation and education – and her group of volunteers. A working group that has been the real engine of these interesting meeting, where different perspectives from which to look at the community art have effectively interwoven. The plot consists of the theoretical interventions: Eugen Van Erven and Tim Prentki talked about the political potential of the applied theater, Antonio Prieto Stambaugh focused on the relationship between collective memory and documentary theater, Evelyn Furqulm Werneck Lima dwelled on dialectics between cities and community artistic processes and, in the last afternoon, we could hear the conclusive provocations of François Matarrasso on the trespassing of the community art. Around these themes, several round tables were held, where the speakers, together with all the participants, deepened and compared experiences, working methods, approaches and techniques. The suggestions coming from the round tables give us back the idea of ​​an encounter that has dealt with the community arts without forgetting the concrete cultural, social and political challenges of the contemporary world. For example, the participants focused on the dissolution of popular cultures and on its consequences in the relationship between memory, subjectivity and identity. There has been much discussion about the political and participatory values ​​of the community arts, both in urban and metropolitan areas, as in rural areas, in different contexts (from therapeutic performative experiences to metropolitan festive actions), as if to demonstrate in practice that the plurality of these experiences is in the first place a treasure to be protected for a greater good which is the common and relational one. A perspective that finds its most useful enzymes in the interdisciplinary and intelligent exploitation of differences and complexity. 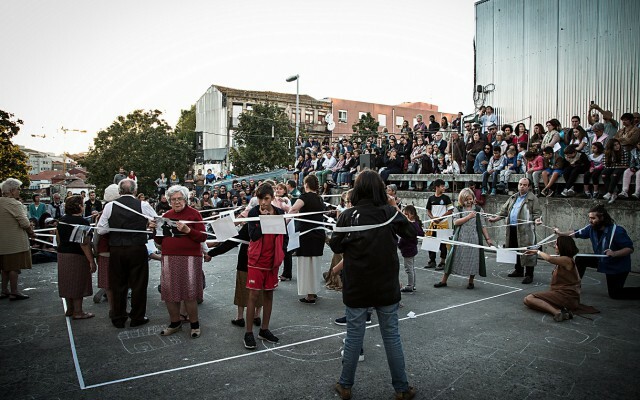 The meeting included active workshops, too, in which to experiment directly work practices, and gave the opportunity to attend and participate in several performances, scheduled within the MEXE festival, organized by Hugo Cruz in collaboration with local groups, companies and art centers. In short, a real all-round immersion in practice and reflection, with multiple formal and informal moments of exchange and comparison. Although EIRPAC has hosted different artistic forms, there is no doubt that theatre in its most diverse declinations has been preponderant. Community theatre moves nimbly among the other arts thanks to its postdramatic and performative approach, and to the fact that the theatrical language reinvents itself in relation to the subjects, their needs and desires. The subject may be the individual, the group or the entire local community who would like to be authors and actors of their imaginary, inventing symbolic systems and signs within which to experience and redefine the ordinary through the extraordinary. A theatre that becomes a living memory, a moment in which even the worst conditions of life take speech and body, incarnate in relationships and affection and help to find out a welcoming humanity. The spaces where the performances were held – which during EIRPAC were the tired and worn areas of the downtown of Porto or theaters, the underground stops, the cemetery, the square – got back to life. They become places of meaning, of future, of hope. “Walls that listen … living walls that tell stories, layers of smells and sounds that overlap over time, perpetuated in the portraits of those who lived in this space and this memory. Archipelagos of lives intertwined in narrow corridors and alleyways without exit, crushed in the everyday life in a space without secrets where the walls are doors and windows for days that won’t last much. Different generations that cross each other during the daily troubles: in the corners, in the houses, in the trees, in the garden … and meet in the will to build an island where there are no skyscrapers”. 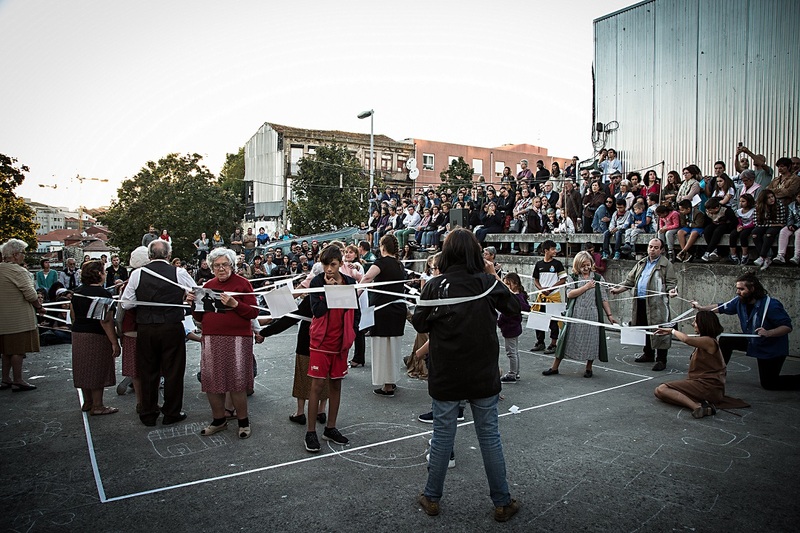 The text comes from CAL Estreia, an intense community performance realized at the bairo of São Vitor in which forty people of various ages and backgrounds were involved. Th eperformance focuses on the housing and social complexities of the neighborhood, poor and populous, even if placed in the center of the city. An action of shared creativity that has generated bonds, rekindled hopes, re-elaborated painful memories. An experience, in the full sense of the term. Aesthetic distillation of direct, profound and personal knowledge, at the same time unique and yet common. For us, who participated in the final performance, it meant understanding and sharing the experience of that community, with a sense of an ancient nostalgia for our human community.